Hi ho Silver. Large silver beads set off this adjustable, two strand bracelet. My first ever Barn Beadin’ Party early this week yielded a lot of laughs and even a few Christmas gifts for equestrians in the Lehigh Valley. I met up with the horse folk from Durham Creek Farm at My Father’s Beads, where I taught them how to turn their horses’ tails into jewelry. We had a blast. 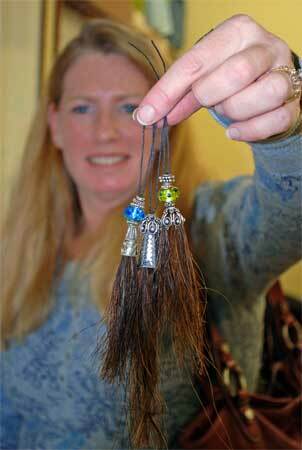 These horse hair tassels are pretty enough to put on a Christmas Tree. 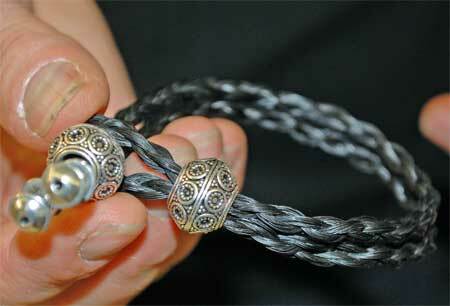 Some took to the bracelet-making and aced the four-strand braid. Others found their groove making tassles with their horses’ tails. I love these classes at My Father’s Beads. Imaginations run wild in the bead store, and everyone comes up with a completely different project utilizing the same basic ingredients. 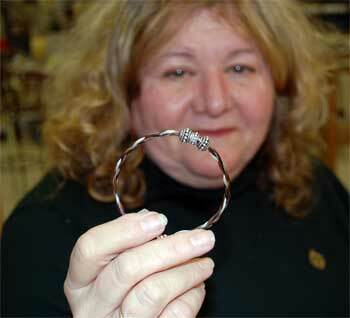 Trish, a beader and equestrian, whipped up this bracelet in no time. If your barn in interested in having a barn party at your barn or at a local bead store, contact me and we’ll set something up. This entry was posted in Events, Horse Hair, Jewelry and tagged barn party, class, event, horse hair jewelry, My FAther's Beads by Susan. Bookmark the permalink.